Kanō Naonobu (1607-1650). Gō (art names): Jitekisai; Shinsetsusai. Naonobu was a Kanō School painter born in Kyoto, and worked in both Kyoto and Edo. He was the son of Kanō Takanobu and younger brother of Tan’yu, and was a pupil of both. He also studied under Kanō Kōi. The Kanō School were a family of artists who dominated Japanese painting from the fifteenth to the seventeenth centuries. Originally a minor warrior clan, the Kanō family’s artistic heritage can be traced back to Kanō Masanobu (1434-1530). 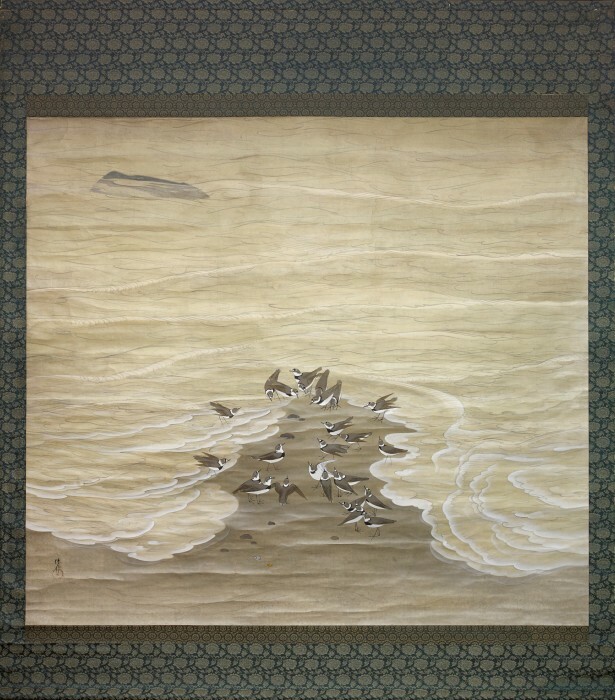 Masanobu combined the strong brushwork of the Chinese-influenced suiboku-ga (water-ink painting) tradition with the decorative colour schemes of the native Japanese Tosa school to create a vibrant new style which quickly won favour with aristocrats desirous of an art form which glorified their power. This innovative style was further developed by successive generations of Kanō artists, most of whom served as court painters and decorators to the great feudal lords and religious institutions of Muromachi and Momoyama Japan. In 1623 Naonobu was appointed goyō eshi (official painter) to the shogun’s court, and in 1626 he worked with Tan’yu for Tokugawa Iemitsu (1604-1651), the third shogun of the Tokugawa dynasty, in Nijō Castle, Kyoto. Summoned to Edo in 1630, he was given an estate and went on to found the Kokibichō branch of the Kanō family. In Edo, Naonobu instructed the shogun Tokugawa Hidetada (1579-1632) on painting. Naonobu and his brother Tan’yu are considered the two great Kanō artists of the early Edo period. 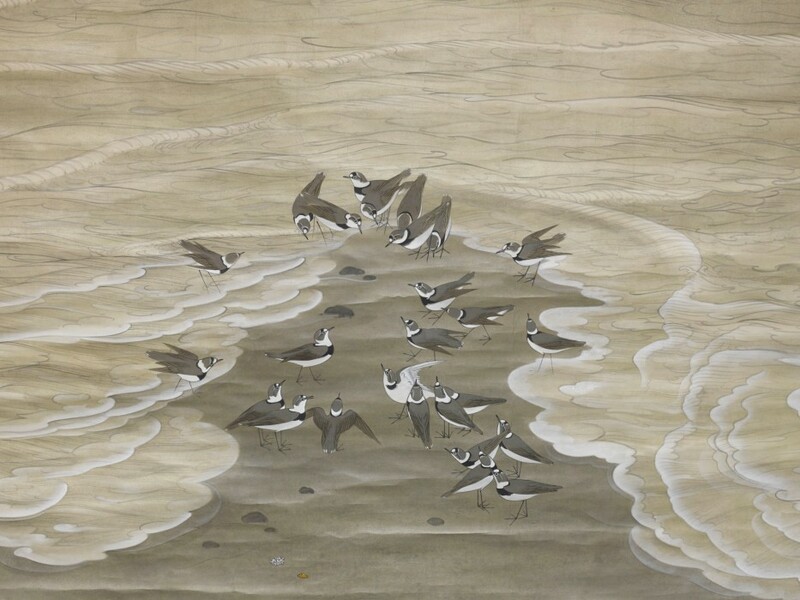 Naonobu’s paintings are closer to the suiboku-ga (water-ink painting) tradition than are the more elaborately detailed paintings of his more famous brother, Tanyū. He was known for his sō (‘grass’ – a term borrowed from calligraphy, also called ‘running’) style of brushwork, combining broad, free strokes with a simple ink wash to create an impression of brevity and freshness. Works by the artist can be found in: The British Museum, London; Brooklyn Museum, New York; The Metropolitan Museum of Art, New York; Museum of Fine Arts, Boston; Freer Sackler, Washington; Harvard Art Museums, Cambridge, MA; Tokyo Fuji Art Museum, Tokyo. SKU: 7559. Categories: Kakemono, Paintings, Scrolls. Tags: flower, moon, plum.